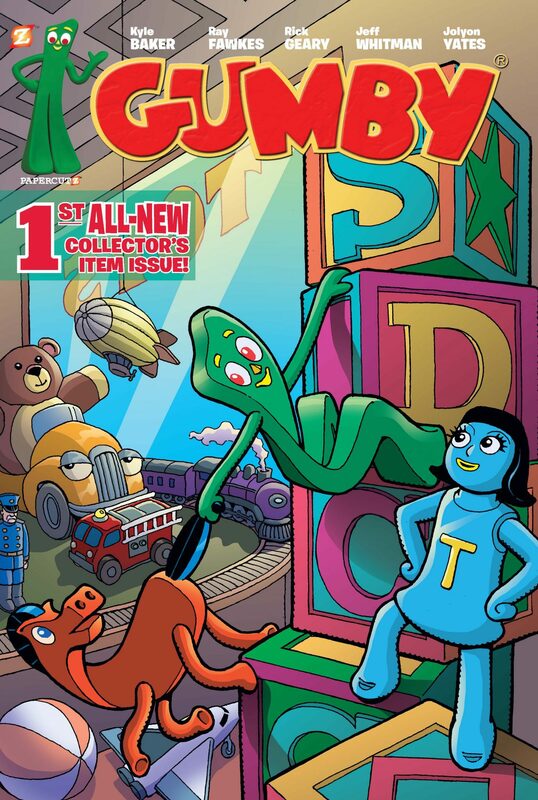 Gumby #1 Review – AiPT! Proving comic books don’t need to be “adult” or “gritty” to be a good time. Gumby #1 features three short tales about the classic cartoon character and his various clay friends. Is it good? This is clearly meant to be an all-ages comic, and that’s not a bad thing. The various creative teams all do solid jobs, and there is a lot about this issue that I am able to appreciate, even as an adult. The comic consists of three different stories, all of which capture the feeling of old cartoons. There is a strong emphasis on friendship, energy, and a touch (or several) of the charmingly weird. The issue’s first story, “An Alien Abundance,” is drawn by Jolyon Yates, written by Jeff Whitman, and colored by Laurie E. Smith. This segment is a heartfelt callback to the very first Gumby cartoon, and features a species of moon creatures from that episode. The writing is strong all around, and I especially have to give the creators credit for how distinct each character’s voice is. Yates’ art renders exaggerated facial expressions and body movement very well. I love the bright color work, especially when Smith utilizes a pixel-esque style to depict a video game setting. Overall, this first story both looked and read like a Saturday morning cartoon, and I enjoyed it. The issue’s third story, “Gumby and Pokey in the Land of Ice Cream,” has a similar feel to the first. This is partially due to the fact that they share the same penciller (while Ray Fawkes writes and Matt Herms colors the third story). This portion of the issue shares the first’s bright, cartoony aesthetic, but the plot isn’t quite as charming. It’s not that it’s bad, it just feels a bit rushed and doesn’t have as many charming small details. The second story is the most unique of the three, and is written, drawn, and colored by Kyle Baker. “Model-y Crew” features Gumby and his friends trying to help a model get ready for a fashion show, and running into complications every step of the way. The hijinks that ensue are legitimately funny; contemporary references to the likes of Taylor Swift and Orange Is the New Black are integrated well and help prevent the story from feeling dated. Baker delivers solid work, both narratively and artistically. Overall, this is a good issue. Gumby is an all-ages title that I can imagine both children and some adults enjoying. With that said, it is fairly formulaic, and I’m not sure if adults with no previous knowledge of the cartoons would find certain plot devices charming or off-putting. This isn’t the most memorable kids-oriented comic you’ll ever read by any means, and its third portion feels comparatively lacking in charm, but I would still recommend Gumby #1. I had fun reading it, and that counts for a lot. This issue has its flaws, but is still a surprising amount of fun. It just goes to show how comic books don't need to be "adult" or "gritty" to be a good time.